How do I communicate with staff via the Dispatch Board? With ServiceM8 app, staff can communicate with each other via iPhones, iPads and with dispatch staff via the dispatch board. Enter the staff members mobile / cell number if required (this will be remembered for future messages). Enter your message to the staff member and click Send. Note: if the staff member doesn't have an active iPhone/iPad device with the ServiceM8 app installed, an SMS message will be sent to their mobile. If they do, the message will be sent directly via ServiceM8 using a push notification (no charge). 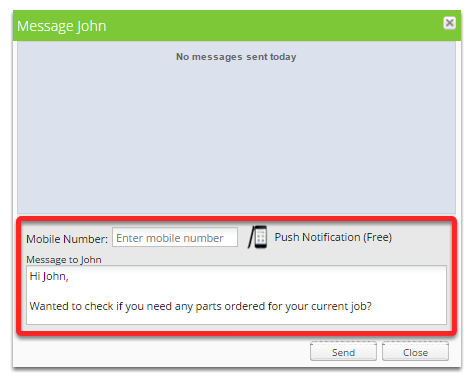 What's New in ServiceM8 2.0 App?